The Napoleonic Code (French: Code Napoléon; officially Code civil des Français, referred to as (le) Code civil) is the French civil code established under Napoleon I in 1804. It was drafted by a commission of four eminent jurists and entered into force on 21 March 1804. The Code, with its stress on clearly written and accessible law, was a major step in replacing the previous patchwork of feudal laws. Historian Robert Holtman regards it as one of the few documents that have influenced the whole world. The Napoleonic Code was not the first legal code to be established in a European country with a civil legal system; it was preceded by the Codex Maximilianeus bavaricus civilis (Bavaria, 1756), the Allgemeines Landrecht (Prussia, 1794), and the West Galician Code (Galicia, then part of Austria, 1797). It was, however, the first modern legal code to be adopted with a pan-European scope, and it strongly influenced the law of many of the countries formed during and after the Napoleonic Wars. The Napoleonic Code influenced developing countries outside Europe, especially in the Middle East, attempting to modernize their countries through legal reforms. civil procedure (moved into a separate code in 1806). Napoleon set out to reform the French legal system in accordance with the ideas of the French Revolution, because the old feudal and royal laws seemed confusing and contradictory. Before the Napoleonic Code, France did not have a single set of laws; law consisted mainly of local customs, which had sometimes been officially compiled in "customals" (coutumes), notably the Custom of Paris. There were also exemptions, privileges, and special charters granted by the kings or other feudal lords. During the Revolution, the last vestiges of feudalism were abolished. Specifically, as to civil law, the many different bodies of law used in different parts of France were replaced by a single legal code. Jean-Jacques Régis de Cambacérès led this drafting process. His drafts of 1793 (for which he had been given a one-month deadline), 1794, and 1799, however, were adopted only piecemeal by a National Convention more concerned about the turmoil resulting from the various wars and strife with other European powers. A fresh start was made after Napoleon came to power in 1799. A commission of four eminent jurists was appointed in 1800, including Louis-Joseph Faure and chaired by Cambacérès (now Second Consul), and sometimes by the First Consul, Napoleon himself. The Code was complete by 1801, after intensive scrutiny by the Council of State, but was not published until 21 March 1804. 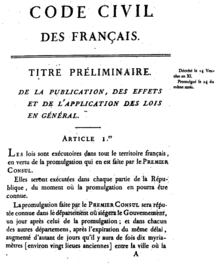 It was promulgated as the "Civil Code of the French" (Code civil des Français), but was renamed "the Napoleonic Code" (Code Napoléon) from 1807 to 1815, and once again after the Second French Empire. The process developed mainly out of the various customals, but was inspired by Justinian’s sixth-century codification of Roman law, the Corpus Iuris Civilis and, within that, Justinian's Code (Codex). The Napoleonic Code, however, differed from Justinian’s in important ways: it incorporated all kinds of earlier rules, not only legislation; it was not a collection of edited extracts, but a comprehensive rewrite; its structure was much more rational; it had no religious content; and it was written in the vernacular. The development of the Napoleonic Code was a fundamental change in the nature of the civil law system, making laws clearer and more accessible. It also superseded the former conflict between royal legislative power and, particularly in the final years before the Revolution, protests by judges representing views and privileges of the social classes to which they belonged. Such conflict led the Revolutionaries to take a negative view of judges making law. This is reflected in the Napoleonic Code provision prohibiting judges from deciding a case by way of introducing a general rule (Article 5), since the creation of general rules is an exercise of legislative and not of judicial power. In theory, there is thus no case law in France. However, the courts still had to fill in the gaps in the laws and regulations and, indeed, were prohibited from refusing to do so (Article 4). Moreover, both the code and legislation have required judicial interpretation. Thus a vast body of case law has come into existence. There is no rule of stare decisis (binding precedent) in French law, but decisions by important courts have become more or less equivalent to case law (see jurisprudence constante). The preliminary article of the Code established certain important provisions regarding the rule of law. Laws could be applied only if they had been duly promulgated, and then only if they had been published officially (including provisions for publishing delays, given the means of communication available at the time). Thus, no secret laws were authorized. It prohibited ex post facto laws (i.e. laws that apply to events that occurred before their introduction). The code also prohibited judges from refusing justice on grounds of insufficiency of the law, thereby encouraging them to interpret the law. On the other hand, it prohibited judges from passing general judgments of a legislative value (see above). With regard to family, the Code established the supremacy of the man over the wife and children, which was the general legal situation in Europe at the time. A woman was given fewer rights than a minor. Divorce by mutual consent was abolished in 1804. The Draft on Military Code was presented to Napoleon by the Special Commission headed by Pierre Daru in June 1805; however, as the War Against the Third Coalition progressed, the Code was put aside and never implemented. In 1791, Louis Michel le Peletier de Saint-Fargeau presented a new criminal code to the national Constituent Assembly. He explained that it outlawed only "true crimes", and not "phony offenses created by superstition, feudalism, the tax system, and [royal] despotism". He did not list the crimes "created by superstition". The new penal code did not mention blasphemy, heresy, sacrilege, witchcraft or homosexuality, which led to these former offences being swiftly decriminalized. In 1810, a new criminal code was issued under Napoleon. As with the Penal Code of 1791, it did not contain provisions for religious crimes or homosexuality. As the entire legal system was being overhauled, the code of civil procedure was adopted in 1806. This had to do with the legal system, specifically how judges were corresponding over different regions of France. The commercial code (code de commerce) was adopted in 1807. The kernel of the commercial code is the BOOK III, "Of The Different Modes Of Acquiring Property", of the Napoleonic Code. It is a norm about the contracts and transactions. In 1808, a code of criminal instruction (code d'instruction criminelle) was published. This code laid out criminal procedure. The parlement system, from before the Revolution, had been guilty of much abuse, while the criminal courts established by the Revolution were a complex and ineffective system, subject to many local pressures. The genesis of this code resulted in much debate. The resulting code is the basis of the modern so-called "inquisitorial system" of criminal courts, used in France and many civil law countries, though significantly changed since Bonaparte's day (especially with regard to the expansion of the rights of the defendant). The French Revolution's Declaration of the Rights of Man and of the Citizen declared that suspects were presumed to be innocent until they had been declared guilty by a court. A concern of Bonaparte's was the possibility of arbitrary arrest, or excessive remand (imprisonment prior to a trial). Bonaparte remarked that care should be taken to preserve personal freedoms, especially when the case was before the Imperial Court: "these courts would have a great strength, they should be prohibited from abusing this situation against weak citizens without connections." However, remand still was the usual procedure for defendants suspected of serious crimes such as murder. The possibility of lengthy remand periods was one reason why the Napoleonic Code was criticized for its de facto presumption of guilt, particularly in common law countries. Another reason was the combination of magistrate and prosecutor in one position. However, the legal proceedings did not have de jure presumption of guilt; for instance, the juror’s oath explicitly required that the jury not betray the interests of the defendants and not ignore the means of defense. The rules governing court proceedings, by today’s standards, gave significant power to the prosecution; however, criminal justice in European countries in those days tended to side with repression. For instance, it was only in 1836 that prisoners charged with a felony were given a formal right to counsel, in England. In comparison, article 294 of the Napoleonic Code of Criminal Procedure allowed the defendant to have a lawyer before the Court of Assizes (judging felonies), and mandated the court to appoint a lawyer for the defendant if the defendant did not have one (failure to do so rendered the proceedings null). Whether or not the Cour d'assises, whose task was to judge severe crimes, were to operate with a jury was a topic of considerable controversy. Bonaparte supported jury trials (or petit jury), and they were finally adopted. On the other hand, Bonaparte was opposed to the indictment jury ("grand jury" of common law countries), and preferred to give this task to the criminal division of the Court of Appeals. Some special courts were created to judge of criminals who could intimidate the jury. Bonaparte also insisted that the courts judging civil and criminal cases should be the same, if only to give them more prestige. The French codes, now more than 60 in number, are frequently amended, as well as judicially re-interpreted. Therefore, for over a century all of the codes in force have been documented in the annually revised editions published by Dalloz (Paris). These editions consist of thorough annotations, with references to other codes, relevant statutes, judicial decisions (even if unpublished), and international instruments. The "small (petit)" version of the Civil Code in this form is nearly 3,000 pages, available in print and online. Additional material, including scholarly articles, is added in the larger "expert (expert)" version and the still larger "mega (méga)" version, both of which are available in print and on searchable CD-ROM. By this stage, it has been suggested, the Civil Code has become "less a book than a database". The Commission observes that the age of drawing up new codes is probably reaching its end. The aim of a nearly complete codification of the law is no longer pursued, for three reasons: firstly, the technical developments by which texts are provided in non-physical form offer to users modes of access that are comparable in many ways to those available through a code; secondly, the creation of new codes encounters a kind of law of diminishing returns in that, the more progress that is made in the development of new codes, the trickier it becomes to determine in which code particular provisions should be located; and, finally, it is clear that certain kinds of provision [...] are unsuitable for codification, since codification makes sense only when it involves provisions that possess sufficient generality. A year later, the Commission recommended that, after its current codification projects were completed, there should not be any further codes; an additional reason was government delay in publishing reforms that the Commission had completed. The government responded encouragingly in March 2013, but the Commission complains that this has not been followed through; in particular, that the government has abandoned its plan for a public service code (code général de la fonction publique). Even though the Napoleonic Code was not the first civil code and did not represent the whole of his empire, it was one of the most influential. It was adopted in many countries occupied by the French during the Napoleonic Wars, and thus formed the basis of the private law systems of Italy, the Netherlands, Belgium, Spain, Portugal (and their former colonies), and Poland (1808–1946). In the German regions on the west bank of the Rhine (Rhenish Palatinate and Prussian Rhine Province), the former Duchy of Berg and the Grand Duchy of Baden, the Napoleonic Code was in use until the introduction of the Bürgerliches Gesetzbuch in 1900 as the first common civil code for the entire German Empire. A number of factors have been shown by Arvind and Stirton to have had a determinative role in the decision by the German states to receive the Code, including territorial concerns, Napoleonic control and influence, the strength of central state institutions, a feudal economy and society, rule by liberal (enlightened despotism) rulers, nativism (local patriotism) among the governing elites, and popular anti-French sentiment. A civil code with strong Napoleonic influences was also adopted in 1864 in Romania, and remained in force until 2011. The Code was also adopted in Egypt as part of the system of mixed courts introduced in Egypt after the fall of Khedive Ismail. The Code was translated into Arabic from the French by Youssef Wahba Pasha between 1881 and 1883. Other codes with some influence in their own right were the Swiss, German, and Austrian codes, but even therein some influence of the French code can be felt, as the Napoleonic Code is considered the first successful codification. Thus, the civil law systems of the countries of modern continental Europe, with the exception of Russia and the Scandinavian countries have, to different degrees, been influenced by the Napoleonic Code. The legal systems of the United Kingdom other than Scotland, as well as Ireland and the Commonwealth, are derived from English common law rather than from Roman roots. Scots law, though also a civil law system, is uncodified; it was strongly influenced by Roman-Dutch legal thought, and after the Act of Union 1707, by English law. The term "Napoleonic Code" is also used to refer to legal codes of other jurisdictions that are influenced by the French Code Napoléon, especially the Civil Code of Lower Canada (replaced in 1994 by the Civil Code of Quebec), mainly derived from the Coutume de Paris, which the British continued to use in Canada following the Treaty of Paris in 1763. Most of the laws in Latin American countries are also heavily based on the Napoleonic Code, e.g. the Chilean Civil Code and the Puerto Rican Civil Code. In the United States, whose legal system is largely based on English common law, the state of Louisiana is unique in having a strong influence from Napoleonic Code and Spanish legal traditions on its civil code (Spanish and French colonial forces quarreled over Louisiana during most of the 1700s, with Spain ultimately ceding the territory to France in 1800, which in turn sold the territory to the United States in 1803). Examples of the practical legal differences between Louisiana and the other states include the bar exam and legal standards of practice for attorneys in Louisiana being significantly different from other states; Louisiana being the only American state to practice forced heirship of a deceased person's estate; and some of Louisiana's laws clashing with the Uniform Commercial Code practiced by the other 49 states. The "Code Napoleon" is mentioned in E. M. Forster's posthumously-published novel Maurice (1971), with reference to France being a safe haven for gay men or, as Maurice puts it, "unspeakable(s) of the Oscar Wilde type." The Napoleonic Code is mentioned by Stanley Kowalski in A Streetcar Named Desire, in an effort to ensure he could benefit from any inheritance his wife Stella might share with her sister Blanche DuBois. ^ Code civil des français: édition originale et seule officielle. Paris: L'Impremerie de la République. XII. 1804. Retrieved November 28, 2016 – via Gallica. ^ Iain Stewart (2012). "Mors Codicis: End of the Age of Codification?". Tulane European & Civil Law Forum. 27: 17 at 23–24. ^ Smith, Bonnie (2006). "Gender". Gale Virtual Reference Library. Charles Scribner's Sons. Retrieved 17 Feb 2016. ^ "The Code Napoléon: French Legislation on Divorce," Exploring the European Past: Texts & Images, Second Edition, ed. Timothy E. Gregory (Mason: Thomson, 2007), 62-64. ^ "Livre III ... du code pénal". Choix de rapports, opinions et discours prononcés à la tribune nationale (in French). VI. Paris: A. Eymery. 1819. p. 320. Retrieved 2008-03-31. ^ "ces délits factices, créés par la superstition, la féodalité, la fiscalité et le despotisme" (id., p 325). ^ "French Criminal Procedure" (PDF). New York Times. 14 April 1895. Retrieved 14 June 2011. ^ "Recherche simple dans les codes en vigueur - Legifrance". legifrance.gouv.fr. ^ "Code civil, Code du travail, tous les livres de droit des Editions Dalloz". dalloz.fr. ^ Iain Stewart (2012). "Mors Codicis: End of the Age of Codification?". Tulane European & Civil Law Forum. 27: 17 at 24–25. ^ Commission supérieure de codification, Vingt et unième rapport annuel 2010 (Paris, 2011), 13; quoted and translated, Iain Stewart (2012). "Mors Codicis: End of the Age of Codification?". Tulane European & Civil Law Forum. 27: 17 at 25. ^ Commission supérieure de codification, Vingt-deuxième rapport annuel 2011 (Paris, 2012), 21. ^ Commission supérieure de codification, Vingt-quatrième rapport annuel 2013 (Paris, 2014), 6-7. ^ a b Arvind TT; Stirton L (March 2010). "Explaining the Reception of the Code Napoleon in Germany: a fuzzy-set qualitative comparative analysis". Legal Studies. 30 (1): 1–29. doi:10.1111/j.1748-121X.2009.00150.x. Archived from the original on 2013-01-05. ^ "Noul Cod civil promovează medierea". 2013-05-05. Retrieved 2013-05-31. ^ Bonfield, Lloyd (2006). "Napoleonic Code". Gale Virtual Reference Library. Charles Scribner's Sons. Retrieved 17 Feb 2016. Schwartz, Bernard, ed. The Code Napoleon and the common-law world: the sesquicentennial lectures delivered at the Law Center of New York University, December 13-15, 1954 (The Lawbook Exchange, Ltd., 1998). 438 pp. Wikisource has the text of the 1911 Encyclopædia Britannica article Code Napoléon. The Code Napoleon, or the French Civil Code; Literally Translated from the Original and Official Edition, Published at Paris, in 1804 by A Barrister at the Inner Temple (1 ed.). London: Printed for Charles Hunter Booksellers. Retrieved 30 November 2016 – via Internet Archive. The "Other" Little Red Book Interview with legal historian Jean-Louis Halpérin in France Magazine.